Are the rumors that they’ve got Oscar the Grouch on Lexapro true? Are you kidding me? Pathetic. This proves that some people have too much free time on their hands. What is this world coming too? Life on Mars becomes appealing everyday. Matt: You’ll have to ask the spam robots, who appear primed for a virtual kidnapping. Sesame Street,of course. Thanks for the email. What is this world coming to when we have to put puppets on a diet?!?!?!? It’s insane!!!! 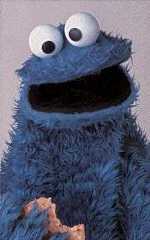 Let the “Cookie Monster” eat his cookies already!! !